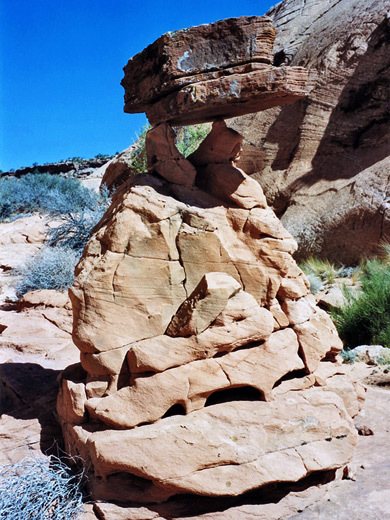 Harris Wash is a major Escalante tributary, and one that offers an easy route to the river - amongst the most popular hikes in the region, this 10 mile trip passes much fine red rock scenery without any obstructions, through a canyon that becomes deep but is never very narrow. Side canyons offer more of a challenge; the longest is Red Breaks which joins the wash close to its main trailhead and heads due north, cutting through various sandstone rock layers with colorful formations, a variety of erosional and water-carved features and with one extended narrows section that is quite testing to explore. This is a journey deep into the wilderness; the canyon is remote, quite pretty and offers total solitude. The signposted side track to the Harris Wash trailhead joins the Hole-in-the-Rock road from the east at mile 11. It passes a small reservoir on the right then traverses a flat, open area towards a small mesa where the route divides. The left fork is required here; this becomes quite bumpy, descending steeply along a ridge and into a small ravine, with two dry streambed crossings that may prove difficult for 2WD vehicles. The final section is along flat land beside the wash, past a corral beneath a sloping sandstone cliff with a series of Moqui steps cut into the rock. Most people camp/park here though the road does continue half a mile more, through a soft sandy area prone to flooding, and ends at the banks of the wash, which is wide, stony and usually dry since at this point the waters flow only after recent rainfall. 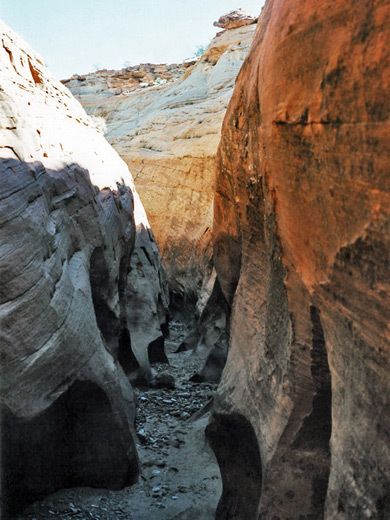 The Harris Wash hike involves simply walking downstream towards the Escalante River, while Red Breaks is reached by crossing the wash and walking along the course of an old track at the far side, which soon descends into the dry streambed at the lower end of the target canyon. 5 views of Red Breaks. TopoQuest topographic map of Red Breaks. After a short distance the streambed becomes enclosed by reddish cliffs a few meters high but remains fairly wide and open, containing a lot of boulders, reeds, trees and bushes and occasional small dryfalls. The first major obstacle is encountered after 30 minutes walking - a vertical step of 20 feet, by-passed by climbing the walls on the east side. Several minor side canyons join the main ravine which cuts through various colorful layers of the Carmel formation, and has flat sections alternating with short eroded channels and pools as it erodes into the different strata. The main narrows start after about one hour of hiking, where the wash enters the Navajo sandstone layer. The passageways are never very deep but are enclosed and quite interesting. The canyon here has frequent pools - usually just 1-2 feet deep - and several chokestones beyond which the canyon continues up to 10 feet higher up and so need careful climbing; in several places the chimneying technique is necessary. After the last such blockage, Red Breaks opens out and next are several shorter, less deep narrow channels separated by wider, sandy stretches. Travel through the narrows section can be avoided by scrambling up to a bench on the east side and walking along above the canyon. Almost three miles from Harris Wash and after about 2 hours walking, the canyon divides - to the right, above a dryfall, is a narrowish passage that doesn't extend too far and is replaced by a shallow streambed that heads towards a butte on the horizon, across a wonderland of eroded rock domes and hoodoos. The main (left) fork soon ends in a pool and a 10 foot drop below a narrow passage; it is not possible to climb up here but beyond the canyon becomes deep and narrow once more, as can be seen by scrambling up the ridge between the two branches and traversing the slopes above.